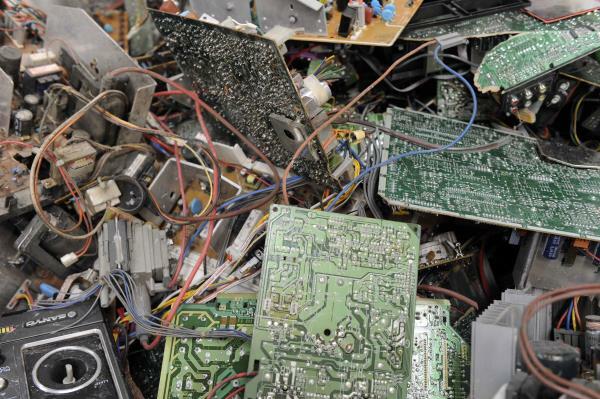 KEEPING electronic waste out of landfill is the goal for Quantum Recycling Solutions. The Dandenong South business was among five to receive City of Greater Dandenong Business Grants Program support on 25 March. Each business will be reimbursed for up to $8000 it spends and receive about $2000 in advice from the Small Business Mentoring Service. The program is designed to encourage business growth, attract investment and generate jobs. In the wake of the grant, Isaacs MP Mark Dreyfus and Greater Dandenong Mayor Sean O’Reilly visited the Rhur Street factory on Monday 30 March. Husband and wife Lokesh Baskaran and Shobana Radhakrishnan own the business. 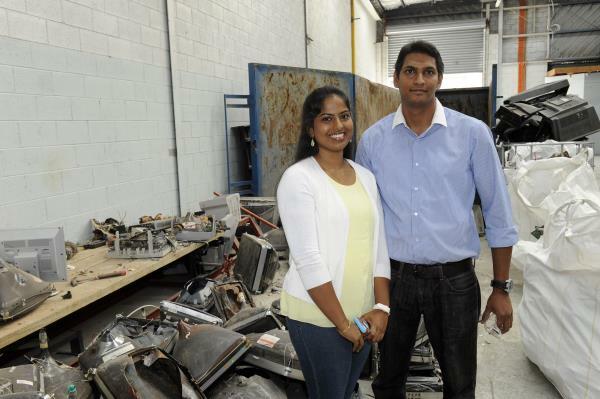 “Shobana’s dad back home is one of the leading recyclers in India,” Mr Baskaran said. “They were going to do the project in India but there’s heavy competition back there. Mr Baskaran graduated from Swinburne with a master’s degree in microeconomics. He couldn’t find a job and managed a Kennards Hire store in Moorabbin for the past seven years. “I finally made the big move and on Friday was my resignation,” he said. He’s now focused on growing Quantum. “The next step is to get another warehouse,” he said. Mr Baskaran said rapid technology changes and falling prices had created a fast-growing surplus of electronic goods around the globe. Few products are recycled, he said, so valuable materials were lost in landfill and poisonous substances could leach into the environment. Quantum’s mission is to dispose e-waste using environmentally friendly technology and keep it out of landfill, including computers, printers, televisions, DVD players, gaming devices and cameras. Mr Baskaran has overcome several setbacks to reach this point. He ordered machines priced in US dollars to set up the business. “I had a big financial crisis because the Aussie dollar went down,” he said. “When the machine arrived here we calculated the power consumption,” he said. Mr Baskaran spoke to his power company and factory owner about upgrading power supply but the plan had a $50,000 price tag. He decided to instead downgrade the machine’s motor and use transformers. Next on his list is finding better ideas to dispose of glass from the cathode ray tubes (CRT) in old televisions. He said it was used crushed to make tiles in the US and could be mixed with sand for filtering and other purposes to save money. “Someone’s got to take the first step,” Mr Baskaran said. The Journal supports the grants program and will profile the other successful businesses in the coming weeks.